Very Early Robot # 4081 with one piece finder mounting 40/2 Zeiss Biotar -- the fastest pre-war Robot lens. Think about it. How many successful 35's were there in the early 1930's? 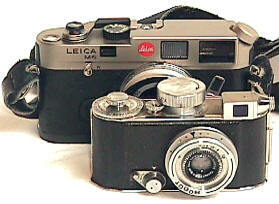 Only two: Leica and Zeiss Contax. The standard 35mm film cartridge would wait until 1936 to be invented. With the market wide open to innovation and new ideas, a watch maker named Heinz Kilfitt in his own early 30's designed a new compact 35 camera around a new format: 24x24 instead of 24x36. This allowed 50 exposures per standard role instead of 36, and alleviated the need to turn the camera on its side for verticals. 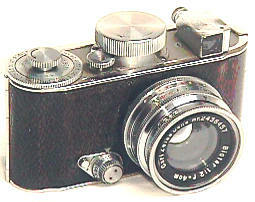 After his design was rejected by Kodak and Agfa, Kilfitt sold his design to 23 year old Hans Berning, who was backed by his successful industrialist father. Otto Berning & Co opened up for business in Dusseldorf Germany and got its first Robot patent in 1934. Robot 1's are hard to find today--only about 30,000 were made through 1938. Oddly, the most famous Robot characteristic was missing from the patent: the Robot spring wound motor drive. From the first production camera however, the new Robot sported a unique motor drive capable of up to 4 fps (with practice) which would advance up to 24 frames without rewinding. 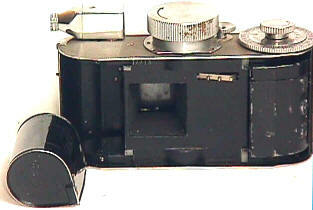 That big round dial on top of the camera is the winding mechanism for the film advance. That's right, the Robot 1 is the first successful motorized still 35mm camera -- not counting some the very early dual purpose cine and still cameras. 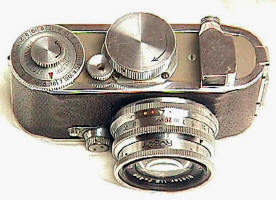 Later Type 1 robot with two piece finder, rotated to 90 degree shooting position with Zeiss 30/2.8 Tessar. The body is very compact and small, especially considering the built in motor drive. Very well made, the body of the Robot 1 is STAINLESS STEEL. Kilfitt designed a rotary shutter with speeds from 1 to 1/500th second. Robots 1's use a 26mm screw mount. A special yellow/green filter is built into the body. Rotating the collar around the front mounted shutter dial inserts or retracts the filter. The film format is 24mm square. 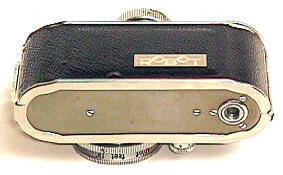 Not capable of using a standard 35mm cartridge, the Robot 1 uses "Type K" Robot film cartridges (which only fit the Robot 1). No K cartridge means no pics. The manually set frame counter rotates about a half turn with each exposure, which means the frame numbers are not consecutive! 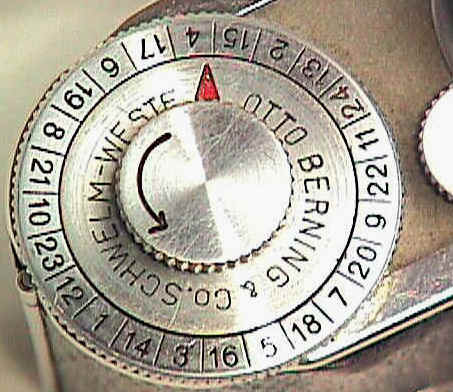 Early Robots carried the "Otto Berning & Co" engraving on the frame counter. The normal viewfinder position is shown on the left. The finder swivels for covert operations. To view your subject at a 90 degree angle so it appears you are photographing something else because you are looking in another direction, turn the viewfinder 90 degrees as shown in the 2nd photo and block off the end of the finder with your finger -- sneaky spy stuff. Notice the high quality of finish and machining...the Robot is very well made. The odd shaped Robot 1 case is often difficult to find today. The camera has no rangefinder...intending to take advantage of the short focus 30mm normal lenses which were almost always in focus. Like Exakta, almost all Robot lenses were produced by independent lens manufacturers, primarily Schneider and Zeiss. The lenses available for the Robot 1 were limited: ranging only from 30mm to 50mm. The Robot II saw the range extended to 75mm. Post war Robot 26mm mount lenses were as long as 400mm---though the Robot body design gives vignetting with longer than 200mm lenses. Any Robot 26mm mount lens longer than 75mm can be regarded as rare. Pre-war lenses left the factory uncoated. User tips 60 years after they left the factory: Push down on the shutter release and keep it down until you hear the film advance--then release the shutter and press it again if you want another shot. The Robot is NOT a continuous advance motordrive. Be careful not to allow your finger to drag on the rotating film counter knob. If the camera has been sitting for awhile, pushing the shutter release about half way down may give a burst of quick exposures which aren't really full shutter cycles. Exercising the shutter by full windings and shutter releases will sometimes get the shutter to working again -- at least for awhile. Make sure the shutter speed are set exactly to the little dot marking...this seems to give less problems. Of course, if the shutter is not working reliably you need it repaired. Alas, Kilfitt did not long stay with the new company. He left after designing the Robot II in 1938. 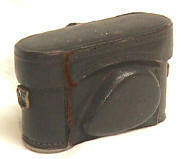 Kilfitt went on to head is own company, building the famous Kilfitt lenses of the 1950's and 1960's. Highlights included the world's first specially designed 35 SLR Macro lenses, profiled here. He retired in the late 1960's and sold his factory to the American firm of Zoomar -- famous for the first production 35 SLR Zoom lens -- the 36-82/2.8 Zoomar which was made in the Kilfitt factory. I was surprised to learn from Marc Small's book on screw mount Leica lenses that Kilfitt also designed the Japanese made 2 1/4 Kowa 6 SLR and the rare diminutive 35mm Mecaflex SLR!! Robot continued on with many models, and continues on today. 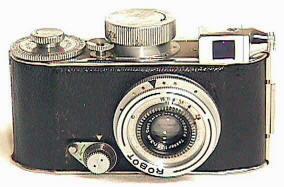 Their most famous camera is probably the black Robot II turned out for the wartime German Luftwaffe Air Force. With its built in motor, the Robot was much more suitable for a wartime fighter camera, yet it sells for a fraction of a Luftwaffe Leica. I can't help wondering which is the better buy in today's market. Small? Did anyone say small? While not usually considered a sub-miniature camera, I have included it in the sub-mini section because the Robot 1 with its 24x24 format is smaller than many half frame cameras that are often considered sub-mini's.